What is the Queenslander garden? The "Queenslander garden" refers here to the type of plants and gardens which would have been associated with a traditional Queensland home, from settlement of the colony in Brisbane to our own grandparents' gardens. If you're restoring an old Queenslander, you might like to consider restoring the garden in a way that's appropriate to your house and suburb. Or, you may have a modern home built in a colonial or Queenslander style, and want to recreate the ambiance of the Queenslander lifestyle. A Cottage Garden would also be be very compatible with a Queenslander home, but what tends to be considered a modern cottage garden style (with a predominance of flowering perennials) is heavily influenced by Northern hemisphere gardens and contemporary gardening magazines. On the other hand, you might just be interested in finding plants that are reliable and easy to grow in this climate. Most old-fashioned plants would have been passed around from neighbour to neighbour and from one generation to the next. These plants would have to be easy to propagate, and easy to keep alive in the days before irrigation systems or even mains water (although they may have had more rain in those days!). Most people enjoy visiting a well prepared private or public garden. Very few understand or appreciate that cataloguing the garden from each bulb and groundcover to the largest tree is vital to a garden's long-term existence and value. There are so few references for Queensland's gardening heritage, it's as though there was no Australia north of the Tweed. We go further to say that the lack of accessable records has made it easy to sweep aside Queensland historic gardens and landscapes. 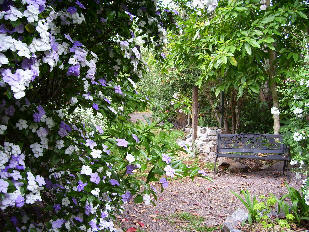 Brunfelsia latifolia (foreground) and Michelia champaca (background) at The Shambles. In order to give future researchers valuable material, existing public and private gardens should have inventories, plans and photographs collated and published in as many formats as possible. My original motivation for keeping an inventory of our garden at "The Shambles" (available at www.montvillegarden.com) was to record the successes and failures among plant species, to assist with maintenance and as a basis for futher research in garden books, magazines and nursery catalogues. We have found that many "old fashioned" colourful ornamentals in our garden are found in the 1875 and 1885 Brisbane Botanical Garden Catalogue as well as in earlier nursery catalogues. In our book "Australian Gardens Making History, the Vital Role of Making and Keeping Garden Inventories" we have attempted to verify the heritage credentials of many common garden plants by consulting such sources. It would appear that early Queensland gardens contained a wide variety of colourful and exotic plants collected in a far more adventurous spirit than today. The genetic material from surviving gardens is a precious resource. Kyleigh & Michael Simpson own "The Shambles" at Montville and have produced a number of books and DVDs about their garden and heritage plants. Visit The Shambles website for more information. As mentioned above, most of the plants associated with old Queensland gardens were easy to grow without a lot of fuss, water or fertiliser. Unfortunately, some of the plants turned out to be a little too easy to grow. Some species are now considered environmental weeds and should not be planted: e.g. Camphor Laurel, Privet, Cocos palm, Ochna. If you've taken over an older home with a neglected garden, there's a good chance the yard already contains a lot of these weeds. Their removal should be factored into your renovation expenses. Below are just a few plant suggestions. The links will take you to the relevant pages on this site for more information on those particular plants. This page is intended to provide information about traditional / heritage / historical / colonial style plants and gardens suitable for Queenslander or "colonial" style houses. However, information about architecture of these houses is more generally available, and links to such information have been provided below. Sometimes they include photographs and snippets of information about the gardens of the time. Some links about garden history from Britain and North America have also been included for historical background. Walter Taylor South Action Group south west suburbs of Brisbane. Rockhampton and District Historical Society Inc. Here are some links about garden history in Europe and North America, should you wish to research historical styles that would have influenced settlers establishing gardens in Australia, or what styles were contemporary in the northern hemisphere at the time. Museum of Garden History London, U.K.
George Washington: Landscape Architect Read about George Washington's garden, including a list of plants he ordered for his Mount Vernon (Virginia) estate from John Bartram's nursery in 1792. The Elizabethan Gardens North Carolina, USA. A tribute to the first English settlers.